Von Trier. Photo taken December 18, 2015 by Joey Grihalva. 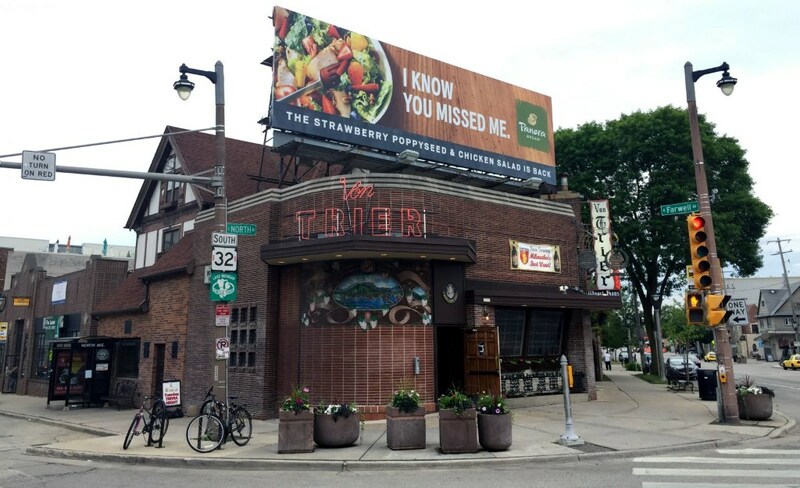 A collective sigh of relief could be heard in all the traditional corners of Milwaukee when Von Trier owners John and Cindy Sidoff announced in November that the bar would remain its German self (with a few upgrades) rather than becoming — the horror — an upscale cocktail lounge. Von Trier closed on Jan. 27 for renovations, but updates from the establishment’s Facebook page marked the official re-opening. We’re back! We’ll have a limited food menu available tonight for our soft opening; Pretzels with Obatzda, German Sausage Medley, Liverwurst Platr, Brat Burger, Trier Burger, VT Beer Brat, Bavarian Bratwurst, Knackwurst, and Weisswurst. Stay tuned as our full food menu will be launching soon but not until sometime next week. Stop by and check out what we’ve done with the place! So we’re thinking there should be enough sausage on hand. While another post said Von Trier was also closed on Monday to finish up renovations, the bar and restaurant will in fact be open seven days a week during regular hours from now on, and the German beer will be flowing. …a few hot-pink, hand-drawn signs in the windows are making it official: Fusion Poke is coming to the space, soon. April 3 – Chef Brad Day, Tullibee (Minneapolis): Brad Day offers hearth-driven food with a wood-burning oven at the center of his kitchen. His menu at Tullibee offers a hearty smoked vegetables, sharable meats & fish and even offal. May 1 – Chef Ryan McCaskey, Acadia (Chicago): McCaskey offers classic dishes with a Contemporary American twist at his Michelin-starred restaurant, Acadia. Inspired by his time spent in Maine since childhood, Chef Ryan’s cooking style pays homage to the flavors found across that state. June 5 – Chef Zachary Baker, Pizza Man (Milwaukee): With a passion for food and wine, Chef Zak Baker creates homey Italian plates with bold flavors including artfully-made pizzas, fresh pastas and sauces. July 24 – Chef Bill Kim, urbanbelly (Chicago): Born in Seoul, South Korea, Chef Bill Kim brings a fun and funky edge to classic Asian flavor at his Chicago restaurants, urbanbelly and bellyQ. This year, Kim released his cookbook, Korean BBQ: Master Your Grill in Seven Sauces, a casual and practical guide to grilling. September 4 – Chef Dan Snowden, Bad Hunter (Chicago): At Bad Hunter, Snowden creates veggie-forward cuisine in an inventive way: these are hearty, vegetable-centered dishes that even the biggest meat-tooth will crave. October 2 – Chef Alex Seidel, Fruition (Denver): Seidel offers fine dining flare with none of the fuss at Fruition. He uses seasonally-focused ingredients with each component holding an instrumental place on the dish. So far, the series is set to close with Chefs Mitch Ciohon and Shay Linkus of Snack Boys on Nov. 6. EsterEv is located within the DanDan restaurant at 360 E. Erie St. in the Third Ward. A second location for Rise & Grind Cafe is in the works, moving into the current space of Growing Power Cafe and Market at 2737 N. Dr. Martin Luther King Dr. Owners Baboonie Tatum and Larina Hightower hope to build a sense of community with their endeavor. Rise & Grind, besides serving tasty meals, will invite local business owners and entrepreneurs to “set up booths, or a table,” Tatum explained. It’s a small piece of a wider push to encourage the growth of local small businesses and revitalization efforts. Tatum adds that they’ll rarely if ever be politically-themed. The new location will be open 7 a.m. to 5 p.m. Tuesday through Friday and 9 a.m. to 3 p.m. Saturday. Rise & Grind’s other cafe is located at 6007 N. Teutonia Ave.
A new breakfast and lunch spot will open in Bay View just in time for summer. Valeri Lucks hopes to turn the building at 2504 E. Oklahoma Ave. into a cafe called SmallPie as early as June. Lucks is also a co-owner of HoneyPie Cafe and Palomino. Honeypie is praised by customers for its varied food options, including vegan and vegetarian offerings, but most importantly, pie. The restaurant makes a long list of rotating, made-from-scratch pies, along with cupcakes, cookies, biscuits and muffins. SmallPie will have similar offerings, though with a cozier presentation. The SmallPie location is just 1,000 square-feet according to city records. The building, built in 1933, sits on an island in the middle of the intersection of E. Oklahoma Ave, S. Delaware Ave. and S. New York Ave. Lucks intends to build an outdoor patio on a portion of the parking lot. SmallPie’s hours are planned to be daily from 7 a.m. to 9 p.m.
Grate Modern Mac & Cheese. Again. The company that owns Milwaukee-area Adobe’s is ready for expansion. The Roaring Fork Restaurant Group is planning a May opening for the second location of Grate Modern Mac & Cheese. The restaurant will be located in Greenfield’s 84South development near South 84th St. and West Layton Ave. The new 2,600-square-foot restaurant will feature a dozen gourmet mac and cheese entrees, such as “Buffalo Chicken,” ”Mexican Street Corn” and “ BBQ Pork.” All Grate menu items are crafted from recipes that are developed in-house using only Wisconsin milk, butter and cheese. Grate features a Woodstone oven on display for guests so they can watch the creation of their mac and cheese entrée from its fresh, grated cheese start to its melted finish in a personal-sized ceramic skillet. The restaurant group worked directly with the chefs at Woodstone to perfect the cooking time and process. Grate is the only mac and cheese restaurant using these premier ovens. The first Grate Mac & Cheese opened in Menomonee Falls last August. Roaring Fork Restaurant Group is a Milwaukee-based business, which owns and operates 56 Qdoba locations. Draft & Vessel (4417 N. Oakland Ave.) could have a second location heading to Wauwatosa. Owner Nathaniel Davauer plans to use his property at 7479 Harwood Ave., and met with the Wauwatosa Plan Commission on Feb. 12 to make his proposal. If all goes well, he’d like to take steps to convert the two-story, three-bedroom, two-bath home into a commercial property. He says the new location would be built to capture the rustic, one-of-a-kind interior of the Shorewood location, which was designed and built with reclaimed materials from the family farm. Davauer says there are numerous pieces which have to come together for the project to come to fruition, including a request to rezone the residential property as well as his ability to obtain a liquor license, a commodity in short supply in Wauwatosa. After four years of selling frozen pops out of carts around Milwaukee, Pete’s Pops will have a brick-and-mortar venue to conduct business. Owner Pete Cooney plans to open up a storefront and production kitchen at 3801 W. Vliet St. The grand-opening is set for June. Cooney also works as the controller for the Pabst Theater Group. Cooney hopes the production area will be operational in April or May, in time to ramp up the making of pops for festival and market season. Pete’s Pops carts still will be at outdoor events around metro Milwaukee in the warm weather once the store opens, Cooney said. Current plans are for the storefront to be open Friday through Sunday.